Reports can be read online on any device, or offline in printed form. Online reports include interactive charts and graphs that bring your data to life, whereas downloaded PDFs are static. Reports can either be created from scratch, or created using a template. Click on ‘Create Report’ in the draft reports section to get started. The default orientation will impact the first ‘page’ of your report. Note: The orientation of pages cannot be changed after creation. You can change the title, and reporting period of a report after it has been created using the ‘settings’ icon in the bottom left corner of the Report Editor. Draft reports are in an editable state and can only be accessed by 'Advisor' (editors) or 'Admin' users by default. 'Client' users can be specifically granted access to draft reports (view only) by an 'Admin' user, via Advanced User Permissions. 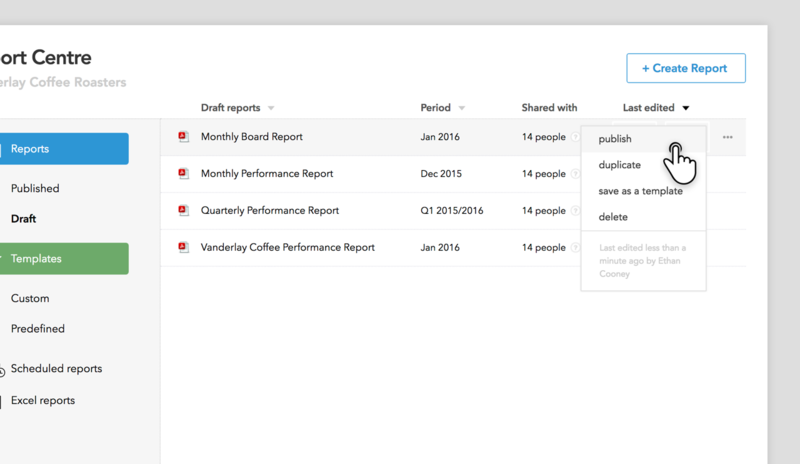 You can publish draft reports directly from the Reports Centre, or from within the Report Editor. Click on the three dots next to a draft report, and click 'Publish'. Published reports are ready for clients to view. They are visible to all people who have been granted access to the company or group. 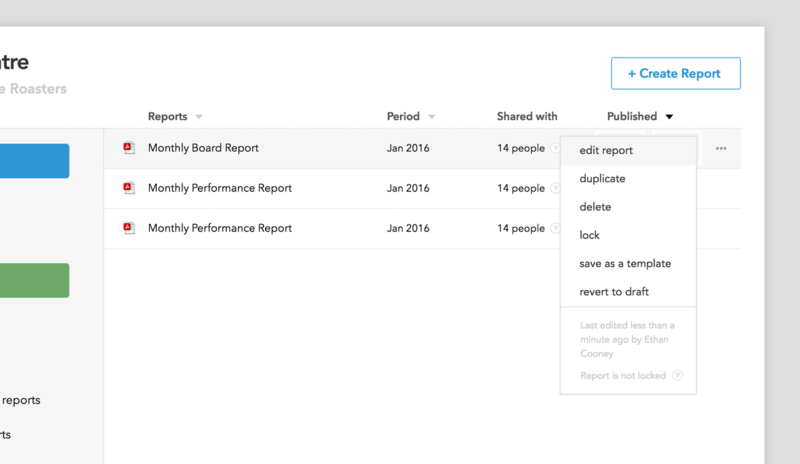 When publishing your report, you can choose whether to send a notification email to certain user groups, or to all users. Who can edit Draft or Published reports? Whether you can edit a report depends on whether it is visible to you. Visibility depends on whether you have access to the company (either by your role, or specific sharing). Your user role must not be 'client (viewer)' -- only ‘advisor (editor)’ or ‘administrators’ can edit reports. The additional menu options (the 3 dots to the far right) open up a range of options for a given draft or published report.